Filing property deeds in Georgia is required for legal transfer of ownership of property. This is a step that must be done to ensure insurance and liability in case of a crime or accident, taxes and all other rights and responsibilities of property ownership. All involved parties should utilize the services of a lawyer to make sure that both groups' interests are protected. When filing a property deed in Georgia make sure that you do not omit any steps to prevent your deed application from being denied by the county. 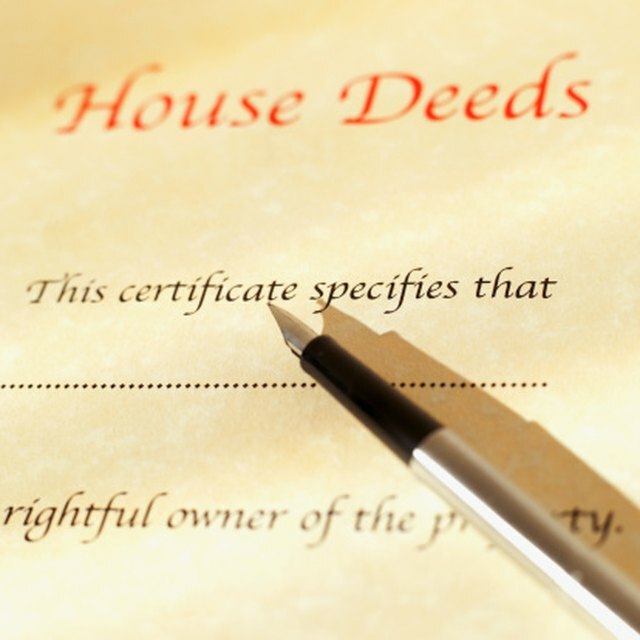 Determine the type of deed that you will need to file. The state of Georgia recognizes several different types of property deeds including warranty, quitclaim, individual, corporate and living trust deeds. The type of deed required is determined by the property type and your own needs for the property ownership. Gather required supporting documentation. The state of Georgia requires that both parties present state issued identification when filing a deed. Filers may also be required to submit additional paperwork such as previous deeds to the property, a copy of the will of a previous owner or copy of death certificate. Retrieve a copy of required deed filing forms. These are forms from the county courthouse necessary to file the deed but cannot serve as a replacement for the actual legal deed itself. Courthouse forms require both parties to enter their personal contact information and fill out basic deed information such as the location of the property. This serves as the indexing form for the deed in public records. These forms can be collected at the county courthouse where the deed is to be filed. All forms must be signed and witnessed in front of a notary licensed in the state of Georgia to be valid. If one party is not able to be there because of injury or death when the form is notarized, supplemental notarized paperwork must be provided, including a copy of a death certificate or letter from legal power of attorney. Make a copy of all filed paperwork for personal reference. If needed for quick reference, it would be easier to access your personal files than those of the county. Keep paperwork with receipt of fee payment or other proof of filing. Filers must be prepared to pay a fee amount to file a deed in Georgia. This fee is determined by the county and varies by the type of deed filed. All fees must be paid at the time of filing. The general rule in Georgia as determined by the State Clerk's Office sets the base cost to file a deed at $10 for the first page and $2 per page for all subsequent pages. This applies only to the deed itself, not to any additional required paperwork. File the deed paperwork with the county. Paperwork can be filed in person at the county courthouse or by mail. Make sure to include the fee and all supporting documentation required, including copies of photo identification if necessary. When filing by mail, make sure to send the package by certified mail. Filing in a court house in person provides more legal protection to both parties. Utilizing the services of a lawyer ensures that you are meeting all state and county requirements. Make sure that you file the correct type of deed form for your property. If all required information is not provided your deed can be found void. Make sure that you file the correct type of deed form for your property. If all required information is not provided your deed can be found void. Filing in a court house in person provides more legal protection to both parties. Utilizing the services of a lawyer ensures that you are meeting all state and county requirements.